During the Great War, there was a uniform which at one time was seen everywhere but is now largely forgotten. This was the Hospital or Convalescent Blues worn by injured or recovering soldiers. The men in this photograph taken at a Stirlingshire hospital are wearing them. The uniforms were pale blue in colour, made of a flannelette material and were large and loose fitting, more like pyjamas. Hospital Blues had many purposes. The loose fit ensured that they could be worn by men of different sizes. They were clean and comfortable, taking the place of lice and flea -ridden uniforms of the men injured on the battlefield. A bright red neck tie was worn, making sure that all who saw them knew of their status as injured soldiers. There were no pockets in the Blues uniform, as no soldier was allowed money in hospital. Officers did not wear this uniform. 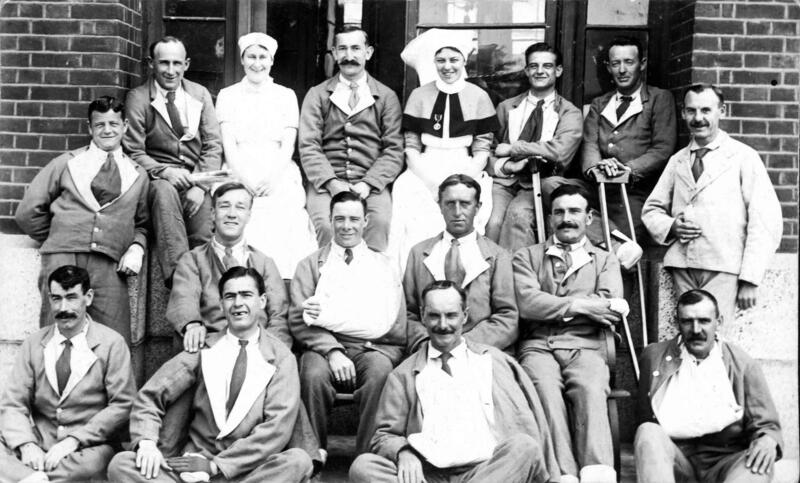 This photograph loaned to the Smith by Marion Jackson has a written message from her grandfather who is the man at the back between two nurses: ‘I am never far from the ladies. This is better than selling sausages’. Peter Roberts was a butcher in Allan Park before the Great War. The shop later became the Allan Park Post Office.